The Monsanto Forest Park is a public park located in the western area of Lisbon, north from Belém Quarter. It’s one of Lisbonites old favourite for weekends and one of the best places I know to relax on a weekday if you’re in a solitary “lone wolf” mood. This is also one of the first places that I have good memories from my childhood – and where I will definitely take my baby. The park is situated in a small mountain range. Due to intensive agricultural usage, the original vegetation was destroyed and the soil was very poor. The original idea for the reforestation of the park dates from 1868, but only in 1934 did the plans for the replantation from Duarte Pacheco (Secretary of State for the Public Works) start. Farmers and prisoners worked together and architect Keil do Amaral gave shape to a modern ecological park with leisure and sports areas. 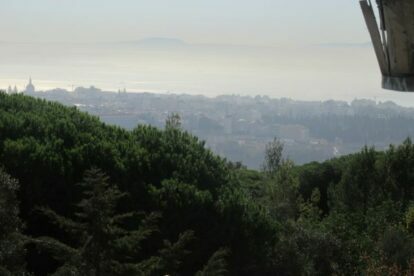 Monsanto is the largest green patch of Lisbon and one of the largest urban forests in Europe, with a total area of 1000 Ha (10km²). In 1959, the Monsanto Park Circuit hosted the Portuguese Formula 1 Grand Prix. Inside the Forest Park there are several other Parks and facilities: there’s picnic areas, beautiful gardens, restaurants, kid-friendly playgrounds, tennis courts, basketball and football fields, open-air amphitheatres, mountain bike trails, climbing facilities, a skate park and even a camping site! The best way to reach it to grab your bike and use the Monsanto Green Lane. Explore the nature and relax!